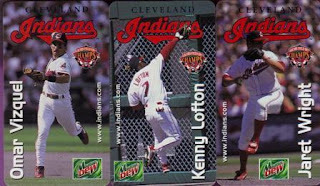 Indians Baseball Cards: Some of that Indians magnetism! These are "Jacobs Field Era Champs" magnets. They are not-quite baseball card sized, but they're close enough to put in 9-pocket pages! 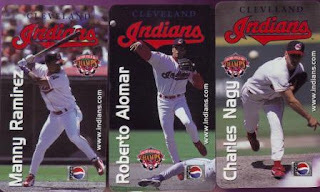 There, we see Manny (before he was "Being Manny" and all that now may stand for) Ramirez, Roberto Alomar, and Charles Nagy. As many of you know, I loves me some oddballs! And, this magnetically-charged six-pack fits the bill quite nicely! Quick question - where do you get those storage "shelves" for your cards? You pictured them back around your 12 Days giveaway or Halloween... you know, the ones with rows and separate pull-out boxes? My collection needs some serious organizing, and separating by team seems to be the most logical way of doing it. I'm hoping Michael's has them, otherwise I suppose I can just order them online... baseball card shops are few and far between out here in San Diego! I got them from BCW (bcwsupplies.com). The individual boxes are the SKU: 802 and the storage shelves are SKU: HOUSE (storage house). Each HOUSE holds 12 of the 802's. I bought four HOUSES and enough 802's to fill them (so I'd have enough for all teams plus extras).